Cellusyn Labs has their own version of a product that mainly utilizes Garcinia Cambogia. They market it by claiming it contains "Super Citrimax" and state that they have a 90-Day money back guarantee. But, our researchers also found out some other interesting facts. Read on for more information. Cellusyn comes packaged in a very professional looking bottle and it is fairly priced at $39.99 per bottle. However, looks can be deceiving. 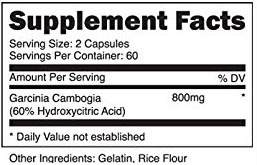 Yes, this product does contain a decent amount of Garcinia Cambogia per pill, but is it enough? Each serving contains about 800 mg of Garcinia Cambogia, but their Garcinia Cambogia extract only contains about 60% Hydroxycitric Acid (HCA). We strongly believe that Garcinia Cambogia products should have over 60% HCA extract in order to be truly effective. Other products may somewhat work and produce low to moderate results with this percentage of HCA, but unfortunately Cellusyn's reviews are highly mixed and mostly low. Many people report not seeing any results. 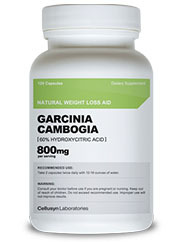 800mg of Garcinia Cambogia per capsule, a fair price point, and a supposed 90 day return policy make this product. Low 60% Hydroxycitric Acid content, lack of product information and low customer reviews. Questionable marketing and low information really seems to be the name of the game with this product. Although the company's website is sleek and easy to read, it also does not provide very much information on what is in their product. For instance, there is no in-depth explanation of what their special "Super Citrimax" is. Judging by the name alone, we assume that it means they have a decent dosage of Hydroxycitric Acid. But, again at only 60% we don't believe this to be true. Our team found it even more questionable when we attempted to find a written return policy on their site. We did not find one and everywhere we looked it simply asked us to contact the customer support page. Some customers may not think twice about this, but we feel that it is questionable to do because it may allow them to change their return policy as they see fit. This could be great for their customers or it could mean they could take advantage of them. Cellusyn Garcinia Cambogia main characteristics: 800 mg, 60% HCA. Cellusyn Garcinia Cambogia does not provide enough information about their product on their website. This, coupled with a low percentage of Hydroxycitric Acid in their product and consequently low reviews, makes us hesitant to truly recommend the product to our readers. Supposedly, it has worked somewhat for some of their customers, but we believe our readers' money and time is best spent elsewhere.